My first attempt at reaching the Bohemia Saddle this year was on July 4th. I tried a slightly different approach from what I'd used in '98, and took road 2213 up from where the pavement ends on road 22. This cuts about a half hour off of the time as it avoids the loop around grass mountain on road 5850, but is a bit steeper and more difficult than the unpaved part of road 22. I started seeing patches of snow at about 3700 feet. There were a few trillium and other less showy wild flowers around, but nothing like the fields of yellow fawn lilies I had seen a week before up in Holland Meadows. It looked like road 744, the connector from road 5850, was still deep under snow, so it's a good thing I didn't try comming that way! Road 767 had not been much travelled yet. There were still places were small trees had fallen across it. Elsewhere I had to scoot way along the edge of the road to avoid a large patch of snow. The Noonday Ridge road (road 2212) had been plowed fairly recently in preparation for the Miner's breakfast at the Bohemia Saddle on July 18th. It was rather muddy in places due to the snow, three feet thick in places, melting. Here's a view of the Bohemia Mining District from the Noonday Ridge Road. Bohemia Mountain is on the right, and Fairview Peak is on the left. 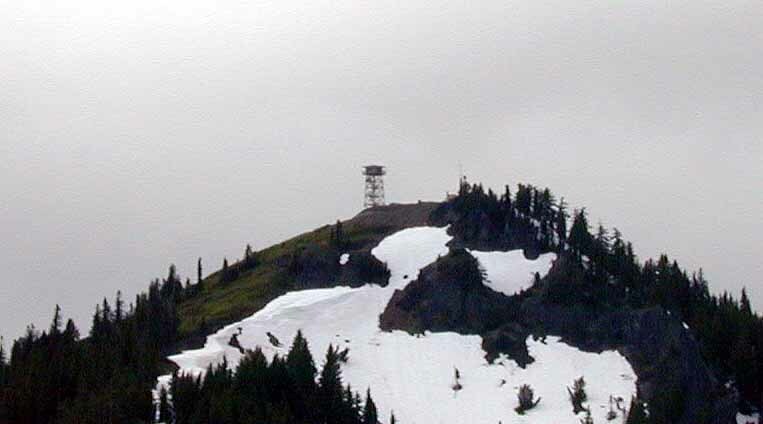 You can see the lookout tower on top of Fairview Peak. Here's a closeup of Fairview Peak with better detail of the tower. By the time I had gotten to the Champion Saddle I had had enough of the muck. I was also getting a bit chilled, and it was getting late, and figured that there was only more of the same up at the Bohemia Saddle, so I went down the Champion Creek road. This is the fastest way back down to Brice Creek, though it is pretty steep, and rather rocky in places. It had also been plowed, and was a bit muddy down to about 4000 feet. The whole ride was 68 miles, with about 5500 feet of climbing, and no mechanical problems.